Remember “The Texas Miracle”? It was the story of how Rick Perry was going to be president because his state, Texas, was doing so much better than all the other states. Texas was doing so well, we were told, because it was very conservative: Low taxes, light regulation, and few pesky unions. We were supposed to compare Texas to California, which, we were told, was an apocalyptic mess because it was run by liberals. Then we sort of stopped hearing about The Texas Miracle for a while, because Rick Perry forgot how to count and it no longer seemed like he was personally responsible for managing the economy of his vast state, but conservatives still enjoy telling themselves that Texas proves that their economic policy preferences are objectively superior to those of liberals. Except, well, maybe Texas isn’t that miraculous. At Washington Monthly, Phillip Longman argues that Texas’ growth is fueled primarily by the energy boom and by population growth. And that population growth is not happening because people from other states are fleeing to Texas to avoid high taxes and onerous regulations, but because of immigration from Mexico and a high birthrate. More importantly (and probably obviously, to people who care about such things), the spoils of the Texas miracle have not been shared equally: Economic mobility is higher in California’s major urban areas than in those of Texas. 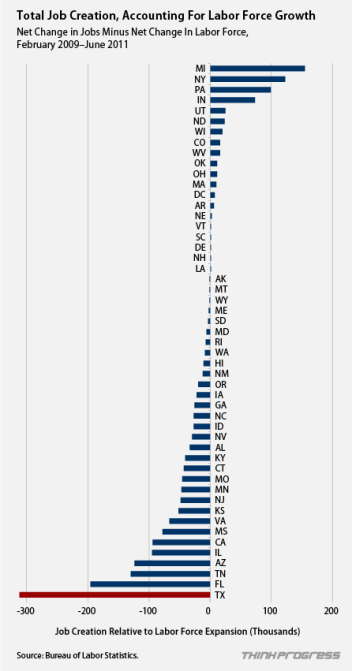 Plus: “Texas has more minimum-wage jobs than any other state, and only Mississippi exceeds it with the most minimum-wage workers per capita.” Texas is falling behind various states in terms of per capita income. But regardless of its sources, population growth fuels economic growth. It swells the supply and lowers the cost of labor, while at the same time adding to the demand for new products and services. As the population of Texas swelled by more than 24 percent from 2000 to 2013, so did the demand for just about everything, from houses to highways to strip malls. And this, combined with huge new flows of oil and gas dollars, plus increased trade with Mexico, favored Texas with strong job creation numbers. Even if it is the case that the Texas miracle is driven primarily by a resource boom and population growth, conservatives and libertarians could still argue that Texas is booming because of their preferred policies. They support exploiting natural resources, and libertarians, at least, support open borders. To use another example, while it’s a fact that North Dakota’s economic boom is happening almost solely because North Dakota happens to be on top of tremendous amounts of very valuable natural resources that recently became easier to extract, conservatives would argue that they are the ones who support drilling that oil, damn the environmental consequences. This is not unusual for a conservative state. As the Institute on Taxation and Economic Policy says: “States praised as ‘low tax’ are often high tax states for low and middle income families.” So… is this part of the conservative policy package that we are supposed to introduce everywhere to spur growth? Slash taxes for the rich and raise taxes on… the poor and middle class? It seems like it might be difficult to campaign on that. When “growth” is its own self-justifying goal, creating an economy that only delivers for a privileged few doesn’t really seem like a problem. Still, don’t move to Texas expecting a better life, unless you own a petrochemical refinery.